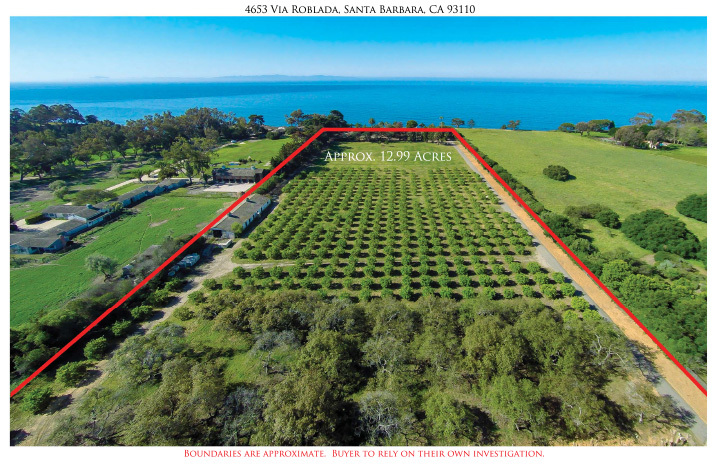 Sited high on a bluff looking across the shimmering Pacific to the Channel Islands is a magnificent estate property of approximately 13 acres. Designed by Selden Kennedy, the approximate 4,900 square foot Adobe style home combines elements of Futurism and Traditionalism that ideally befit its Hope Ranch location; a much coveted equestrian enclave known for its miles of bridle paths, charming country lanes and private access to Hope Ranch beach. 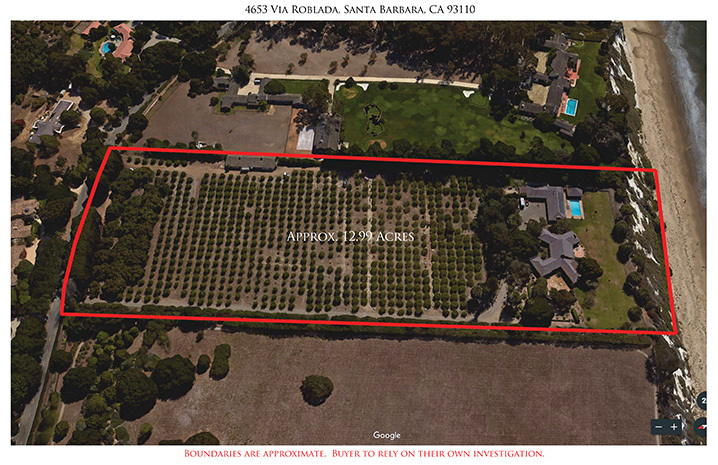 Located on prestigious Via Roblada and shielded by a stand of tall eucalyptus trees, the long entry drive leads past acres of avocados and citrus to the circular motor court of the main residence. Kennedy used adobe bricks extensively in the construction; their rustic elegance gives the home its enduring sense of permanence and its cultural link to the Spanish and Mission heritage of early California. The exterior walls rise to door height where redwood siding continues to the roof eaves. With a nod to Asian design the roof line was given a Japanese “lift”. Kennedy’s design included walls of floor to ceiling glass to emphasize the uniquely California design ethos of indoor/outdoor living. Double front doors open to an entry that offers immediate views to the Pacific. This hallway also services the Dining Room and Library. A colonnaded central hallway leads from the Entry to the inviting and graciously proportioned Living Room where incredible adobe walls are showcased. The use of adobe brick in early California construction is well known as it was a particularly durable material with a high thermal mass that naturally moderated living space temperature. The rough textured finish gives the walls a sense of historical authenticity and integrity. Respectful of original adobe construction techniques, Kennedy designed a lintel over the tall windows and doors, and the walls were finished in rough troweled plaster to protect the bricks; a note of particular interest, all interior and exterior bricks were molded on site. The room’s plaster and beam ceiling creates an informal, yet sophisticated atmosphere. Interior finishes include redwood, walnut, mahogany, Italian marble and wrought iron fixtures. On axis with the Living Room is the lovely Dining Room. The oval design and formal elegance of the room with elegant wall covering and crown molding is a delightful juxtaposition to the rustic textured walls and linear design of the home. All cabinetry was designed and built to mirror the oval shape of the room. Located just beyond the Dining Room is the handsome Library that features a wood burning fireplace and walls lined with extensive book cases. Spectacular views of the Pacific are afforded in every direction. 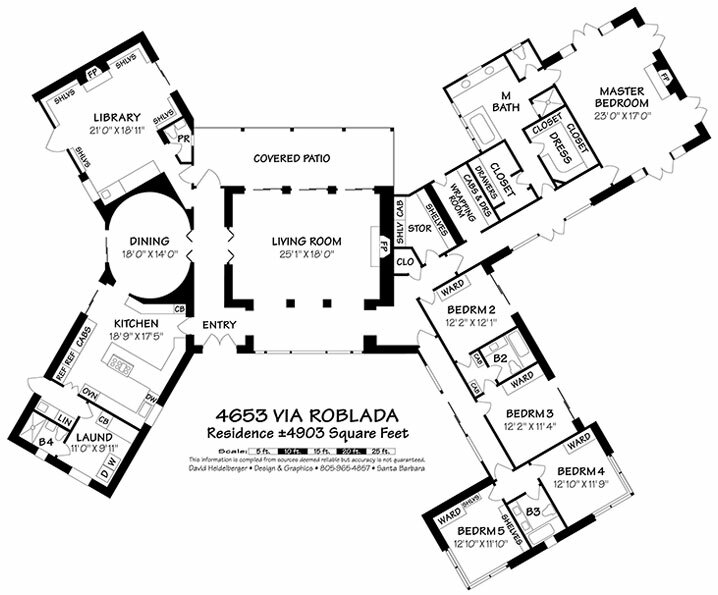 Beyond the Living Room, the Master suite is separated from the family/guest bedrooms by its own private wing. The focal point of the Master suite is a dramatic raised hearth fireplace where an evening’s fire can be enjoyed. Expansive French doors open to a private terrace that enjoys phenomenal vistas to the ocean bluff. A distressed panel and open beam ceiling contribute to the room’s unique character. The Master bath is very spacious and includes dual vanities, bath, and separate shower. Dual walk-in closets complete the Master wing. 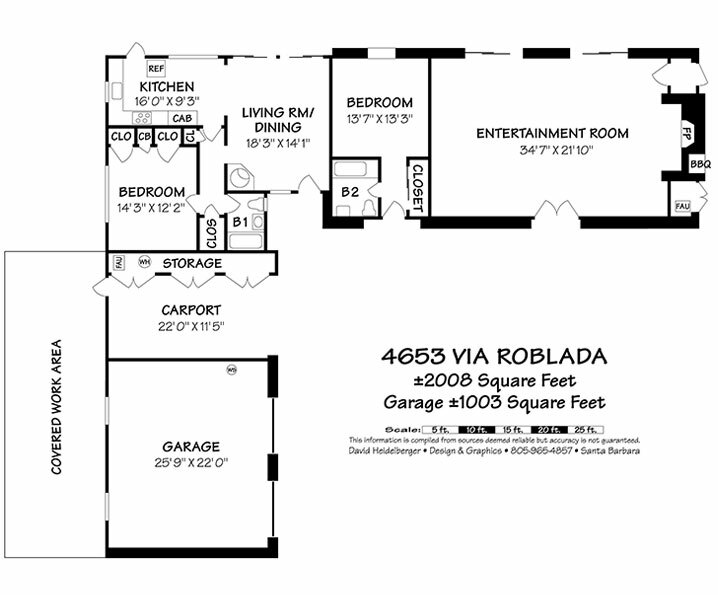 Four bedrooms, each sharing a bath, comprise the family/guest wing. Each room enjoys garden vistas and feature wonderful natural light. The Service wing includes a well-appointed kitchen and pantry area; laundry and linen rooms, and a service bath. The swimming pool and an approximate 2,000 square foot cabana and guest cottage were added in 1972. The entertainment room of approximately 755 square feet looks out over the pool and is the ideal setting for billiards or table tennis. A large fireplace and outdoor barbecue make this a truly popular weekend gathering place. A bedroom and bath is located adjacent to this room. A separate guest apartment with living room/dining room, open kitchen and a bedroom and bath is ideal for guests or a full-time caretaker. Attached to the structure is a two-car garage and car port that are serviced by a motor court. A separate pool pavilion is a wonderful spot for outdoor dining and restful poolside afternoons. This is one of the last truly original bluff top properties in Hope Ranch. As the eye drops from the high Palm lined cliffs to the pristine white sands of the beach below, the beauty of this ocean view aerie can be truly appreciated. The spectacular setting, breathtaking views and ultimate privacy can be enjoyed in its beautifully preserved original state or could be transformed into a truly magnificent and grand residential compound. Like the property’s endless ocean views… the possibilities are limitless.